$200 million from an annual $100 Zero Emission Vehicle fee that would start in 2020. $1.4 billion for other projects. Here's how the funds will be diluted (distributed) throughout the Bay Area. Taxes and fees paid by drivers should not subsidize other modes of transportation. Do not create a state-level tax or fee to fund local transit agencies — public transit is not underfunded. Stop diverting existing transportation taxes and fees to pay for non-highway purposes. Expand capacity, fix chokepoints and do not restrict new resources to just maintaining the existing system. In 2011, Governor Christine Gregoire created the Connecting Washington Task Force. The group is made up of 31 individuals who were appointed by the governor. In December, the task force recommended a vague ten-year, $20 billion transportation tax package. Task force members did not identify specific projects nor did they recommend specific funding sources. Instead, they identified broad investment areas and listed all the available funding options that were already being considered including gas taxes, tolls, higher sales taxes on vehicle purchases and other transportation-related fees. The final package to be forwarded to voters is now up to state legislators in Olympia and the governor. Since the 1991–1993 legislative biennium, Washington’s transportation budget has grown nearly 250%, from $2.1 billion every two years, to $7.2 billion every two years. Some of the revenue growth stems from two motor vehicle fuel tax increases in 2003 and 2005. Washington State’s gas tax rate is currently 37.5 cents per gallon and ranks as the seventh highest in the country. In 2000, drivers paid about $744 million in gas taxes and by 2010, gas taxes paid by drivers had risen to $1.2 billion, a 61% increase. State lawmakers have also increased driver-related licenses, permits and fees. In 2000, driver-related fees totaled about $315 million, and rose to $511 million by 2010, a 62% increase. These transportation taxes and fee hikes do not count the various local increases that officials have imposed recently. Particularly in King County, where taxpayers have experienced six significant increases in sales taxes, property taxes and motor vehicle excise taxes to pay for public transit. In 2001, statewide public transit agencies collected about $484 million in sales taxes. By 2010, public transit agencies collected about $1.23 billion in sales taxes, a 150% increase in sales tax collections in just ten years. Despite the significant growth in transportation taxes and fee revenue , state officials are now considering another increase. Before they ask voters to pay more, WPC offers the following recommendations for state leaders to consider when preparing a final ballot measure. Drivers pay most of the taxes and fees that fund the state’s transportation obligations. Nationally and in Washington state, the highway system was constructed largely on the philosophy that users would pay. This user fee theory successfully built 7,000 miles of roadway and allows Washingtonians to drive nearly 60 billion miles per year, producing industry, mobility, economic freedom and a higher quality of life for everyone. Over the years however, more of the taxes and fees paid by drivers are being used to subsidize other modes of transportation and other non-highway purposes. Applying a multi-modal approach to a transportation tax package is important, but the hands of government should not dig into the pockets of drivers to subsidize these other modes. Drivers have their own infrastructure needs and the taxes and fees they pay should fund road, highway and bridge improvements. Likewise, transit users, bicyclists and rail passengers should fund their own infrastructure needs, or rely on local, general tax support. Historically, the primary funding source for local transit agencies has been sales taxes. Sales taxes apply to the broader public to support transit operations. This same philosophy is precisely why gas taxes are protected by the 18th Amendment to the Washington State Constitution. In 1921, officials implemented Washington’s first gas tax of one cent per gallon. With this new revenue stream, state leaders were able to build, operate, maintain and expand Washington’s highway network. And as the state’s transportation infrastructure needs increased, so did the tax. Today, Washington’s gas tax rate is 37.5 cents per gallon. Seventy years ago, as they often do today, politicians saw spending opportunities in a new and stable revenue stream, and they began to divert gas tax collections to programs and services not related to roads or highways. According to the Washington State Good Roads Association (WSGRA), more than $10 million in gas taxes were diverted to other purposes in the ten years between 1933 and 1943. This gave rise to a popular statewide effort to protect motor vehicle fuel taxes for their intended purpose. In 1944, Washington voters passed the 18th Amendment to the state constitution, which limits the use of gas tax revenue exclusively to roads and highways. The measure passed and since then, gas tax revenues have been restricted solely to “highway purposes” and to the benefit of the drivers who pay the tax. Raising transportation-related fees, raising the tax on the sale of vehicles and using roadway tolls, all to subsidize other travel modes, are examples of how this practice is unfair and siphons revenue paid by drivers that should instead fund roads to reduce traffic congestion and improve safety. In fact, the governor’s proposal increases taxes and fees paid by drivers by $250 million to pay for public transit. All transportation taxes and fees paid by drivers should be used for highway purposes only, while alternative travel modes should be funded by their own users (which reduces the public subsidy) or through local options that apply to the general public, like sales taxes. Public transit is a local function with its own tax base and the state’s role should be limited to granting local tax authority, not creating a new state-level funding source. A common myth among public transit agencies and the transit lobby is that they are underfunded and need state money to further subsidize transit operations. Public transit is not underfunded in Washington state. There are 31 public transit agencies in Washington and they collected $2.05 billion in total revenues in 2010. To put this in perspective, in 2010 the state collected about the same amount ($2.09 billion) from the three major revenue categories (taxes, fees and miscellaneous) that fund the state’s entire transportation budget. Collecting more than $2 billion in a year is remarkable considering how small public transit is compared to the state’s overall transportation system. In 2010, the 31 public transit agencies provided 212 million passenger trips, or about 582,000 trips per day. The federal government estimates that households typically perform an average of 9.5 person trips per day. Washington state has 2.51 million households, which translates to an estimated 24 million person trips per day across the state. This means the 31 public transit agencies’ total market share is only about 2.4% of all daily person trip demand. The primary funding source for the 31 transit agencies is a local option sales tax. Washington state’s primary transportation funding source is the motor vehicle fuel tax (gas tax). The following chart compares the annual sales tax revenue for public transit agencies to the state’s motor vehicle fuel tax collections between 2005 and 2010. In 2010, the 31 public transit agencies collected $1.23 billion in sales taxes. The state collected about $1.21 billion in gas taxes in 2010. This means public transit agencies actually collected more in sales tax revenue than the entire state collected in gas tax revenue. 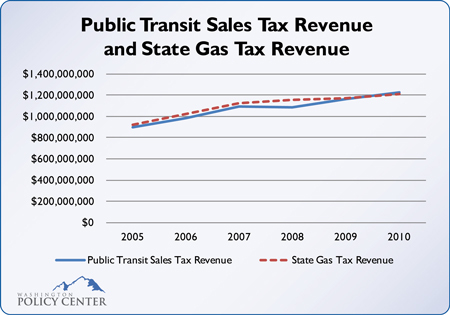 Among public transit agencies, the cumulative sales tax revenue since 2005 was $6.46 billion, while the state’s cumulative gas tax revenue was $6.60 billion over the same time period. Again, this is incredible when you consider how few people actually use public transit compared to the overall transportation system. Transit officials also claim sales tax revenue is volatile and unreliable as a consistent funding source, but public transit’s sales tax revenue has grown 150% in the last ten years, from $484 million in 2001 to $1.23 billion in 2010. Inflation over the same time period only accounts for 23% of this growth. This means sales tax revenue for public transit agencies in Washington state has grown about 6.5 times faster than inflation over the last decade. There also seems to be a misconception that transit ridership continues to rise. In reality, total ridership across the state has been steadily falling since 2008. In 2008, transit’s annual ridership was about 222 million passenger trips. Since then however, transit demand has fallen. Through 2010, public transit’s ridership declined to about 212 million passenger trips, a drop of 4.5%. But transit’s operating expenses have gone the other way. In 2008, total statewide transit operating expenses were about $1.01 billion. By 2010, transit’s operating expenses had risen by $53 million, an increase of about 5%. So public transit officials are serving fewer people but spending more to do it. In another measure, public transit agencies have also accumulated very large reserve funds. In 2010, the 31 public transit agencies stored $1.81 billion in reserves, which is twice as much as they had in 2007 ($915 million). In fact, Unrestricted Cash and Investments ballooned 560% from $171 million in 2007 to $1.13 billion in 2010. A transportation funding package in 2012 should not include a dedicated, state-level funding source for public transit. Transit agencies are not underfunded and they have their own tax authority. Furthermore, transit officials should learn to become more efficient before asking taxpayers for more money. The state already cannot keep pace with funding its current transportation infrastructure needs; infrastructure needs that serve the majority of daily person-trip demand. Any new transportation revenue source at the state level should be used to pay for existing obligations or to expand highway capacity; it should not be diverted to new commitments, such as public transit. Before asking voters for higher taxes and fees, lawmakers should reform policies that divert current transportation revenues and fees to non-highway purposes. Most officials claim the state’s transportation system is underfunded and that current revenues cannot keep pace with simply preserving the system we have. In 2010, the major transportation funding sources (taxes, licenses, permits, fees, & tolls) brought in $2.09 billion in state transportation funding. Most of this revenue was paid by drivers and it should have gone to support the growing backlog of highway infrastructure needs. Yet, through various policies created by the legislature, state officials shifted more than $200 million to non-highway purposes last year alone. Tribally owned gas stations are exempt from paying 75% of state gas taxes. Under the state agreements, tribal stations impose the full state gas tax rate of 37.5 cents per gallon, and then receive an annual refund of 28 cents per gallon sold. The amount of gas taxes refunded to tribes was about $28.14 million in 2010, and tribal leaders have spent some of the gas tax refunds on non-highway purposes. State lawmakers also shift transportation taxes and fees paid by drivers into the state’s Multimodal Account. As the name implies, the Multimodal Account is spent on transit, bicycle, and sidewalk improvements, generally through grant programs. One of the largest recipients of funds from this account is Amtrak. Most of the revenue that funds the Multimodal Account is paid by drivers in the form of a retail sales tax on the sale of motor vehicles and motor vehicle license fees. In 2010, drivers paid about $114 million into the state’s Multimodal Account. Washington State Department of Transportation (WSDOT) officials are required to pay state sales taxes on state transportation projects. This means valuable transportation revenue (paid by drivers) is funneled out of the transportation budget and into the state’s general fund, and then used to pay for non-highway projects like social services, education and general government. WSDOT officials estimate that project delivery costs could be reduced up to 8.5% if their projects were exempt from state sales taxes. The Office of Financial Management estimates WSDOT paid $62 million in state sales taxes in 2010 on its capital construction projects. Each year, drivers pay about $204 million in various transportation taxes and fees that state officials then divert and spend on non-highway purposes. Annually, this amount is equivalent to about seven cents per gallon in the state gas tax rate. These other projects may be important, but they should have their own funding sources, particularly paid by the user group who benefits from the program or service. Drivers have their own infrastructure needs that are not currently being met. Lawmakers should stop diverting current revenues to subsidize other, non-highway purposes and use the money they already have, before asking drivers to pay more. In 2003 and 2005, lawmakers passed two gas tax increases to fund more than 400 road projects across the state. Each proposal was tied to specific projects and taxpayers knew exactly what they were supposed to get. This time around however, lawmakers have only identified broad funding categories, with the stated intent of using the new revenue to preserve the existing system. This means drivers would have to pay higher transportation taxes and fees without receiving any new road capacity. If lawmakers are going to raise taxes and fees on drivers and spend political capital to pass a transportation funding package, they should identify specific projects that fix chokepoints, expand capacity and ultimately reduce traffic congestion. 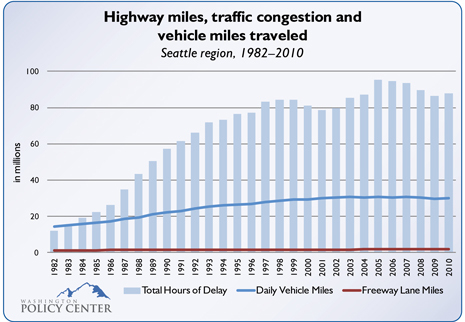 The chart following compares the number of highway lanes, person delay and highway-vehicle miles traveled in the Seattle region between 1982 and 2010. In 1982, drivers traveled about 14.6 million miles per day on highways in the Seattle region. By 2010, the amount of driving doubled to about 29.9 million miles per day on highways in the Seattle region. Yet while the amount of travel demand on the regional highway system has doubled in the last 30 years, the amount of freeway capacity has not. The Seattle region had 1,345 miles of freeway lanes in 1982. In 2010, the region had 1,874 miles. This means that since 1982, regional highway demand increased by 106% while the supply of regional highway lanes only increased by 39% over the same time period. As the demand for highway travel grows faster than the supply of highway lanes, drivers experience increased traffic congestion. Across the Seattle region, total hours of delay are six times higher today, rising from 11.9 million hours in 1982 to 87.9 million hours in 2010. Transportation leaders rely on drivers to fund most of the state’s transportation budget and all of the state’s highway system. In fact, drivers are now being forced to subsidize local transit agencies across Washington, despite a growing list of unmet road and bridge infrastructure needs. But with anti-car policies that mandate reduced driving targets, increased driving taxes and fees and replacing valuable auto lanes with transit and bicycle-only restrictions, drivers are paying more and receiving less. The plan to replace the SR-520 floating bridge does not add any new general purpose lanes to the already-congested configuration that exists today. The deep bore tunnel that will replace the Alaskan Way Viaduct actually reduces the number of existing automobile lanes from six to four, which guarantees more traffic snarls in Seattle and on Interstate 5. Sound Transit officials also plan to remove the reversible center lanes of the Lake Washington I-90 floating bridge, which a Washington State Department of Transportation study shows will increase traffic congestion. This means officials plan to reduce the supply of unrestricted highway lanes around Seattle in the next 20 years despite population estimates that show an increase of more than one million new residents. If drivers are going to pay more in higher transportation taxes and fees, it should be in exchange for projects that not only maintain the current system, but that also reduce traffic congestion. Michael Ennis is director of the Center for Transportation at Washington Policy Center, a non-partisan independent policy research organization in Washington state. Nothing here should be construed as an attempt to aid or hinder the passage of any legislation before any legislative body. For more information, visit washingtonpolicy.org .